BetOnline focuses on the US market, but they’re one of the few bookmakers with zero country restrictions. In our bookmaker review we’ll explain the advantages BetOnline provides when betting on sports. While the website also provides play through poker and casino games, the focus on this review will be on the sportsbook. But before all of that – we’ll open up with some information on BetOnline. The people behind BetOnline have been in the online bookmaking business since 2001 – the year they launched BestLineSports. 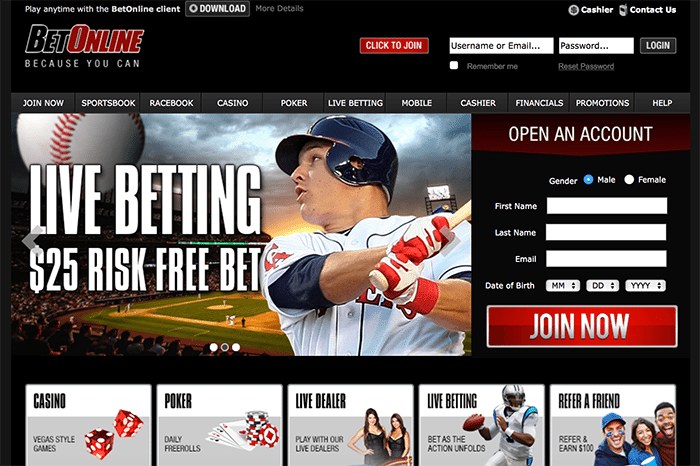 After success with BestLineSports, the company purchased the BetOnline.com domain and saw terrific growth before evolving again to be BetOnline.ag. BetOnline isn’t just a big brand – they accept big bets, hardly ever limit accounts, payout on time and offer a great betting selection – especially if you bet on a lot of US sports. Opening an account is quick and painless. You need your email, full name, address and telephone number. The sportsbook is designed like most and couldn’t be any easier to use if you’re completely new to online betting. Everything can be accessed from one screen. Once signed into your account, click the “Sportsbook” tab at the top of the BetOnline website. From here you can view the sports with open betting markets on the left and the betting markets for the sport you select will show up in the middle of the screen. Once you find your bet, select the bet and it will appear on the “Bet Slip” on the right. Select the type of wager you want to place, the amount you want to bet and confirm the wager. What sportsbook offers a lifetime deposit bonus? BetOnline! Use the bonus code “FIRST” to get 25% on your first deposit ($1000 Max), plus use the bonus code “LIFETIME” to get 25% on every reload deposit ($1000 Max). You must deposit $50+ to get a bonus and there is a six times rollover. The bonus is a free play, which isn’t a good as cash, but the fact you get a bonus on every deposit can’t be beat. New bettors also get a $50 free play for the mobile betting app and a $25 free play for the live betting platform (Full details on BOL Promotions page). There’s another $25 free play available for the online racebook (Horses) at BetOnline. Place your first bet in the racebook to receive the free play. Not only that – BOL offers up to a 7% track rebate in the racebook on most tracks and bet types. Read the full terms to find out if your action qualified for the rebate inside of the racebook. As I mentioned previously – BetOnline definitely has a strong focus on US sports, as most of their client base are Americans. Want to bet on football, basketball, baseball, hockey, lacrosse or mixed martial arts? No problem. There are plenty of other sports too, including soccer, tennis, golf, auto racing, darts, boxing, cricket, rugby, snooker, softball, Olympics and more. However, where some bookies have 1000’s of daily soccer markets to bet on from hundreds of leagues – BetOnline doesn’t have huge international coverage of soccer and therefore you won’t be able to bet on too many leagues apart from the major ones. Betting on the Premier League, Champions League, Europa League or World Cup are all no problem, but betting on a division two match from a league in South America isn’t going to be possible. However, that’s only a problem for the minority. There aren’t a ton of bet types apart from the major betting options either. Sure, you can bet on the money line, point spread, over/under, parlays, teasers, props and futures, but the selection could be way better. I enjoy betting on goalscorer markets and player props, but BetOnline doesn’t have that big of a selection. However, they have some of the biggest limits for popular bet types. Juice is standard ($0.20) for most sports and bet types, but you can bet on dime lines ($0.10) for MLB money lines. Apart from MLB money lines bets – there’s no other reduced juice. The live betting platform at BOL looks like it was designed in the 90’s, but that doesn’t bother me. As long as I can place bets quickly, at good odds and with decent limits – I’m game. BetOnline allows you to bet on a lot of US sports in-play, including basketball, baseball, golf, soccer, hockey, football and more. MLB, NFL and NBA are the best sports to bet live at BetOnline, as there are more betting options. You can bet on a lot of great props. The baseball is awesome – you can bet on how each batter will perform (Hit, Walk/Strikeout/HBP or Any Other Result). Watching the ball game and expect Giancarlo Stanton to get a hit in his next at bat? You can bet on that happening. Everyone is on the go these days and we use our mobile phones more than our computers at this point. Why wouldn’t a sportsbook offer mobile betting? It makes total sense. Even casual bettors can benefit from mobile betting. You may be at work late unexpectedly and need to place your bets for the night’s sports action. You don’t even have to install or download any software to your mobile phone (The app also works on tablets). The easiest way to start betting on your mobile phone at BetOnline is to simply visit the website on your phone using the links on this page. BetOnline will be optimized for your screen size. You can open an account, deposit and start betting in minutes. Plus, all mobile bettors are still eligible for the same bonuses and promotions detailed at the top of the review. Jump on your iOS, Android, Blackberry or Windows device and start betting today with up to $1000 in free plays. Bet as little as a $1 or as much as $25,000 on certain betting markets at the BetOnline Sportsbook. All of the major US sports have $5000 or higher betting limits for straight bets like the ML, O/U and spread. You can even get down $2000 on golf match-ups, which is rare. $500 prop betting limits are also higher than most competitors. BetOnline accepts a wide range of deposit options and there are quite a few withdrawal methods as well, although the options can be a bit limited depending upon where you live, but that’s the case no matter you choose to bet online. If you’re unaware, Americans will have the fewest options, although it’s still a breeze to fund your account and receive payouts. Deposit options include credit cards, e-wallets, debit cards, prepaid cards, bank transfer, person2person transfer, money order and Bitcoin. Skrill and Neteller are the easiest methods for bettors that can use these e-wallets (IE: Europe, UK, Asia). Prepaid cards or person2person transfers (Western Union & MoneyGram) are the best bet for North American bettors. Bitcoin also works great and is simple, but you need a way to withdraw your BTC to cash. That’s easy to find, but at the same time, you have to be careful dealing with 3rd parties. Bank wires are great for bigger deposits and I highly recommend this option. Payouts are done by bank wire, cheque, Skrill Neteller, Bitcoin and person2person transfers. The minimum payout is between $25 to $500 depending upon the method used and the minimum deposit is $50 to $1500 depending upon the method, although most options have a $50 minimum. Payouts are fast and reliable, which is really all that matters. You may never need to use the customer service at BetOnline, but it’s nice knowing someone is available 24/7 to answer any questions or help you with any problems. There’s no live chat, but I’ve posted BetOnline’s contact details below. Join up at BetOnline today and become one of the lucky ones!